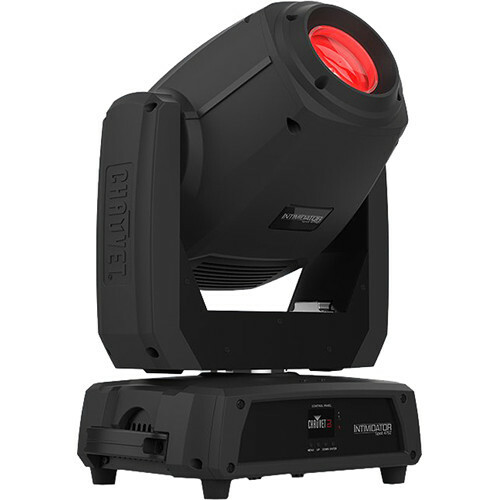 The Chauvet DJ Intimidator Spot 475Z LED Light is a high-output, feature-rich moving head spot fitted with a 250W LED and designed for large-scale events. The fixture utilizes a motorized zoom for short-throw and long-throw applications. The color wheel offers white plus seven colors with dynamic color scrolling capabilities. The instrument features six metal gobos and a single glass gobo that rotate, index, and scroll at variable speeds. The Intimidator Spot 475Z comes equipped with dual gobo wheels for gobo morphing and remarkable midair projections. The dual rotating prims split the beam for greater effect and wider coverage, while the Totem mode ensures the beams always remain on the dance floor. The 475Z includes built-in automated programs, sound-activated programs, a Master/Slave mode, or can be controlled via DMX with 10 or 16 channel modes. Up to 2 units can be power linked using a single 120V circuit. Gobos can be swapped out for customized projections. The Intimidator Spot 475Z ships with a power cord and a hanging bracket with mounting hardware.